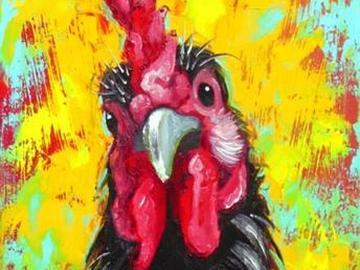 This playful rooster is painted on a vertical 12x24” canvas to capture his playful personality and spirit perfectly! This painting uses vibrant acrylic colors applied with brushes and palette knives to achieve texture on the canvas. Participants will focus on color mixing and adding texture to this unique sized canvas that will brighten any room. He is a perfect addition to other farm animal paintings and décor. No painting or drawing experience is necessary! !